Tommy Karpency had already scored one upset win over a former light heavyweight champion. He had no such success against the current king of the 175-pound division, Adonis Stevenson, who hurt Karpency in the first round, dropped him hard in the second and came out with a technical knockout victory in the third. There was a huge difference between the faded Chad Dawson who Karpency edged last year and the significant obstacle that Stevenson posed. 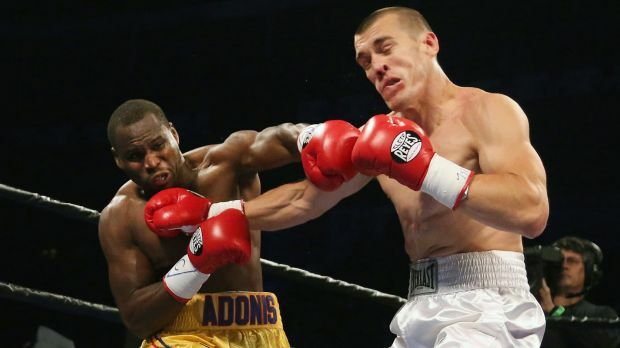 Stevenson’s heavy hands had dethroned Dawson in barely a minute back in 2013, and like that fight it only took one punch for the bout with Karpency to change. Karpency came forward in the first with a flurry of punches, and Stevenson countered with a well-timed southpaw left hand that buckled Karpency’s knees. Karpency picked his spots more cautiously in the second. It still didn’t matter. Toward the end of the round, Stevenson sent a jab to the body and followed with a flush left cross that badly wobbled Karpency, who staggered away and soon went down as Stevenson pursued with punches. The minute’s rest between rounds didn’t help Karpency any. Stevenson went back on the attack in the third and Karpency went down again. Karpency beat the count, but the look on his face gave the referee enough reason to end the fight. It was as easy a win for Stevenson as most had expected. He’s now defended his championship six times since beating Dawson but has faced lower levels of opposition this year. A fight with the other top light heavyweight, Sergey Kovalev, is highly unlikely thanks to the politics of boxing. Instead, Stevenson could end up facing the winners of a pair of upcoming bouts: Andrzej Fonfara vs. Nathan Cleverly and Isaac Chilemba vs. Eleider Alvarez. 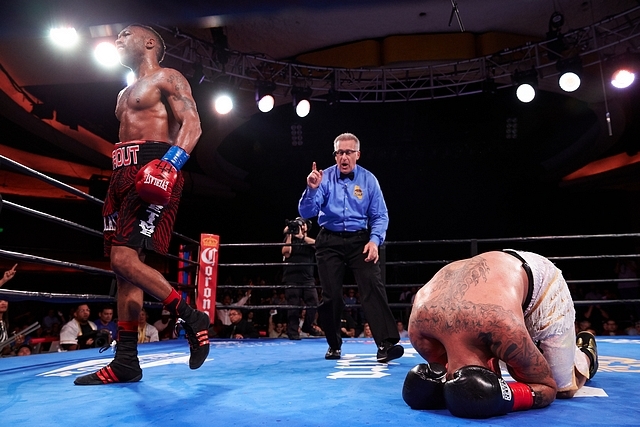 Stevenson beat Fonfara in 2014, though he had to recover from a knockdown in order to do so. A rematch could be enjoyable. 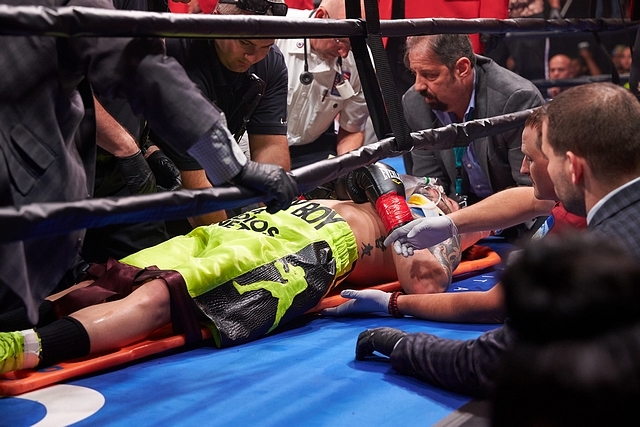 Peter Quillin ended his fight with Michael Zerafa abruptly and frighteningly, hurting him in the fifth round and then following up moments later with a punch that left Zerafa unconscious and led to the loser being taken out of the ring on a stretcher. Quillin, a former titleholder at 160 pounds, came in the overwhelming favorite while the naturally smaller Zerafa was taking a huge step up in level of competition. 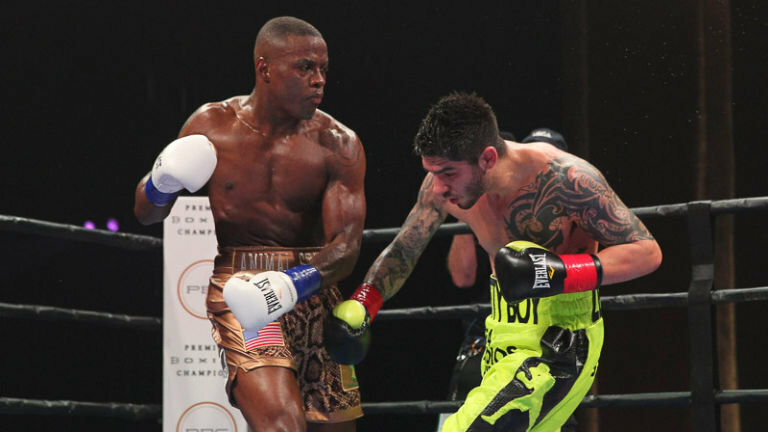 Zerafa was game, seeking to land leads or counters before moving away from Quillin’s retorts. Quillin wasn’t hurt by those shots. He’d unofficially gone from 160 pounds at the weigh-in to 182 pounds on fight night, making him 14 pounds heavier than Zerafa was in the ring. That only served to help him absorb Zerafa’s blows, and it also helped make Quillin’s more powerful punches feel even harder than they may have already. Quillin hadn’t been too active in the first four rounds. It didn’t matter. Soon two punches would bring the bout to an end. First came the right hand Quillin landed as he and Zerafa exchanged shots, catching Zerafa as he pulled straight back from a clinch. Zerafa retreated and Quillin followed, loading up with a right that went between Zerafa’s gloves, connected flush onto Zerafa’s face, and turned off Zerafa’s lights. The win sends Quillin forward to a December fight with Daniel Jacobs, a long-anticipated collision between two middleweights from the New York borough of Brooklyn. This will go down as the year Errol Spence began to move from welterweight prospect into a coming contender in the 147-pound division. Spence looked great in dominating and then dispatching Chris Van Heerden for an eighth-round technical knockout. 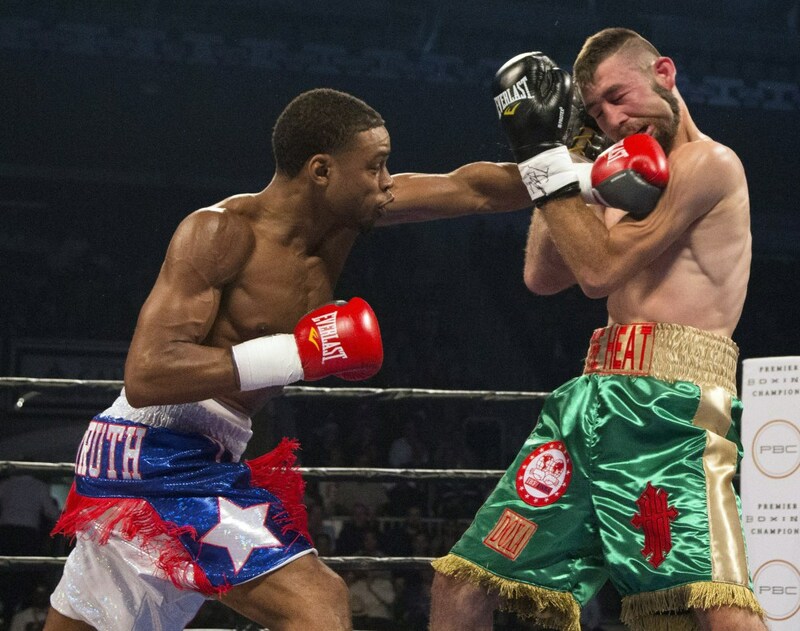 Spence, a member of the United States boxing team in the 2012 Olympics, has like most prospects been gradually stepping up his level of competition. He looks ready to face some truly notable names. Van Heerden wasn’t one, but he also had only lost once before and definitely had never been beaten up the way Spence did to him. Van Heerden ultimately had the fight taken out of him. He tried to throw, but Spence either dodged his punches or took them well. Meanwhile Spence was sending out heavy combinations in punishing volume, closing up Van Heerden’s right eye and making the fight even more difficult for him. By rounds six and seven, pretty much all Van Heerden could do was take shots and then taunt Spence to indicate that those punches didn’t hurt. It was a lie, of course. He was wilting. With a minute to go in the seventh, Spence landed a right jab to the body and followed with a left hand that landed behind Van Heerden’s ear, putting him down on the mat for what was said to be the first time in Van Heerden’s career. The second time would come just a little later from a hard left hand to the body. Van Heerden survived the seventh and told his trainer he wanted to continue. But Spence unleashed an onslaught early in the eighth as Van Heerden covered up against the ropes, and the referee felt it was the right time to end the fight. Spence turns 26 at the beginning of next year and is in one of the deepest divisions in boxing. He’ll have plenty of opportunities to build on what he’s accomplished in 2015. 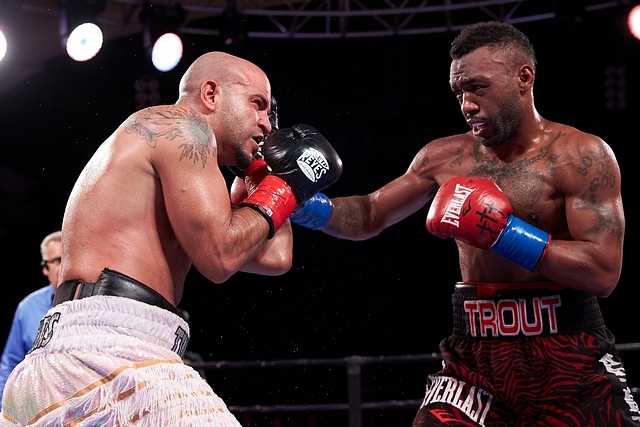 Austin Trout looks ready to challenge himself once more against the best fighters of the 154-pound division. His comeback from a rough 2013 continued with his fourth straight win, this victory coming on a sixth-round knockout against the wonderfully nicknamed Joey “Twinkle Fingers” Hernandez. Trout’s nickname, “No Doubt,” is a pretty good one as well. It was a fitting phrase for the Hernandez fight, too. There was no doubt that Trout was en route to the win. He used his height, long arms and other advantages in skill, technique and physical gifts, building a lead on the scorecards and breaking Hernandez down with combinations to the head and body. Hernandez didn’t like it to the body. He also definitely didn’t like it when a Trout left hand veered low to the hip in the fourth round. Hernandez quickly retaliated when both men clinched, picking Trout up off the mat and throwing him down hard. The referee took a point from Hernandez for the intentional foul. Trout didn’t stop going to the body, though he worked to make sure he stayed above the beltline. It’s a wise choice in any fight, never mind one in which his opponent had some difficulty making weight. And, indeed, it was a series of thudding body shots that brought the fight to an end. Trout called out rising 154-pound contender Julian Williams afterward; Williams had defeated Hernandez earlier this year with a shutout on the scorecards. Even if Trout doesn’t get him next, there are many other options at junior middleweight, and that’s a good thing for a fighter who went from beating Miguel Cotto in 2012 to losing to Canelo Alvarez and Erislandy Lara in 2013. Among the possibilities: Vanes Martirosyan or twin fighters Jermell and Jermall Charlo. A rematch with Lara seems less likely, given how easily Lara won the first time around.